The “Eau Terre Environment” Research Centre (ETE – Research Centre on Water, Earth and the Environment) of INRS (National Institute for Scientific Research) in Quebec City is actively engaged in the sustainable development of the country, particularly in the fields of groundwater, of ground resources and environment. 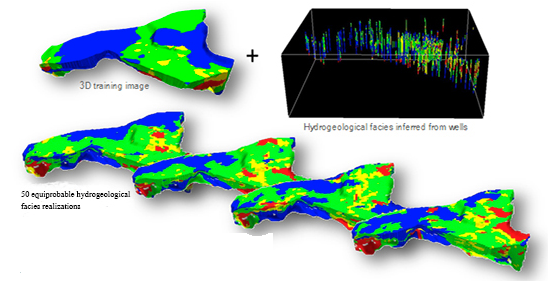 The research conducted by Erwan Gloaguen are at the junction of geophysics, geostatistics, geology and hydrogeology. His team is working on large-scale projects and builds hydrogeological as well as oil reservoir and deposit models. To do this, it needs to smoothly integrate different data formats and characteristics, i.e. well, borehole or seismic data, into a single model. It also needs efficient algorithms for processing large data sets. All geological modeling methods are not suited to all types of geology. The LIAMG must have access to the largest range of possible methodologies because some respond better to given geological data configurations than others. “We have selected Isatis 8 years ago because it was and it is still the only software that offers all the geostatistical functionalities in one single package. Once data is imported, we access quickly and in the same way to advanced methodologies which have proven their effectiveness, “said Erwan Gloaguen. In particular, the ETE center applies Isatis geological facies modeling tools such as the Truncated Gaussian Simulations to model a multi-layer geology or the Multi-point Simulations (Isatis implements the Impala library) or the Plurigaussian Simulations when geology gets complex. The center also enjoys Isatis for its efficient algorithms. Developed for 64-bit multicore systems, the software facilitates the processing of large data sets. Indeed, the LIAMG team works on models from half a million to several million cells. In addition, the team must be able to manage all the model simulated realizations to estimate their spatial uncertainty and to enter them in their optimization algorithms. “The solutions that we present are not only for academic purposes but must also answer concrete issues. Moreover, even in the context of research projects, some of our industrial partners are interested in getting applied deliverables, as geological models or results of simulations, ” says Erwan Gloaguen. ” Because it is used in academia as well as in professional circles, Isatis is an ideal bridge between the industrials and us. The software allows us to provide them with the models developed at the center, so that they appropriate and modify in turn according to their needs”. With multivariate geostatistics, Isatis allows coupling numerical modeling results and measured data to improve the reliability and the realism of the models. Thus, the LIAMG of INRS can, for example, integrate in the same aquifer model a numerical simulation of the groundwater age, a flow model or a mass transport model, which improve consistency between the model from Isatis and what is observed in-situ.